Not to be confused with Majoron. A Majorana fermion (/maɪəˈrɒnə ˈfɛərmiːɒn/), also referred to as a Majorana particle, is a fermion that is its own antiparticle. They were hypothesized by Ettore Majorana in 1937. The term is sometimes used in opposition to a Dirac fermion, which describes fermions that are not their own antiparticles. The concept goes back to Majorana's suggestion in 1937 that neutral spin-​1⁄2 particles can be described by a real wave equation (the Majorana equation), and would therefore be identical to their antiparticle (because the wave functions of particle and antiparticle are related by complex conjugation). In supersymmetry models, neutralinos — superpartners of gauge bosons and Higgs bosons — are Majorana. This convention has the advantage that the Majorana operator squares to the identity. Because particles and antiparticles have opposite conserved charges, Majorana fermions have zero charge. All of the elementary fermions of the Standard Model have gauge charges, so they cannot have fundamental Majorana masses. However, the right-handed sterile neutrinos introduced to explain neutrino oscillation could have Majorana masses. If they do, then at low energy (after electroweak symmetry breaking), by the seesaw mechanism, the neutrino fields would naturally behave as six Majorana fields, with three of them expected to have very high masses (comparable to the GUT scale) and the other three expected to have very low masses (below 1 eV). If right-handed neutrinos exist but do not have a Majorana mass, the neutrinos would instead behave as three Dirac fermions and their antiparticles with masses coming directly from the Higgs interaction, like the other Standard Model fermions. The seesaw mechanism is appealing because it would naturally explain why the observed neutrino masses are so small. However, if the neutrinos are Majorana then they violate the conservation of lepton number and even of B − L.
Neutrinoless double beta decay, which has not (yet) been observed. It can be viewed as two ordinary beta decay events whose resultant antineutrinos immediately annihilate with each other, and is only possible if neutrinos are their own antiparticles. The high-energy analog of the neutrinoless double beta decay process is the production of same-sign charged lepton pairs in hadron colliders; it is being searched for by both the ATLAS and CMS experiments at the Large Hadron Collider. In theories based on left–right symmetry, there is a deep connection between these processes. In the currently most-favored explanation of the smallness of neutrino mass, the seesaw mechanism, the neutrino is “naturally” a Majorana fermion. Majorana fermions cannot possess intrinsic electric or magnetic moments, only toroidal moments. Such minimal interaction with electromagnetic fields makes them potential candidates for cold dark matter. In superconducting materials, Majorana fermions can emerge as (non-fundamental) quasiparticles (more commonly referred to as Bogoliubov quasiparticles in condensed matter physics). This becomes possible because a quasiparticle in a superconductor is its own antiparticle.
. Majorana fermions can be bound to a defect at zero energy, and then the combined objects are called Majorana bound states or Majorana zero modes. This name is more appropriate than Majorana fermion (although the distinction is not always made in the literature), because the statistics of these objects is no longer fermionic. Instead, the Majorana bound states are an example of non-abelian anyons: interchanging them changes the state of the system in a way that depends only on the order in which the exchange was performed. The non-abelian statistics that Majorana bound states possess allows them to be used as a building block for a topological quantum computer. A quantum vortex in certain superconductors or superfluids can trap midgap states, so this is one source of Majorana bound states. Shockley states at the end points of superconducting wires or line defects are an alternative, purely electrical, source. An altogether different source uses the fractional quantum Hall effect as a substitute for the superconductor. The aforementioned experiments marks a possible verification of independent 2010 theoretical proposals from two groups predicting the solid state manifestation of Majorana bound states in semiconducting wires. However, it was also pointed out that some other trivial non-topological bounded states could highly mimic the zero voltage conductance peak of Majorana bound state. The subtle relation between those trivial bound states and Majorana bound states was reported by the researchers in Niels Bohr Institute, who can directly "watch" coalescing Andreev bound states evolving into Majorana bound states, thanks to a much cleaner semiconductor-superconductor hybrid system. In 2014, evidence of Majorana bound states was also observed using a low-temperature scanning tunneling microscope, by scientists at Princeton University. It was suggested that Majorana bound states appeared at the edges of a chain of iron atoms formed on the surface of superconducting lead. The detection was not decisive because of possible alternative explanations. Majorana fermions may also emerge as quasiparticles in quantum spin liquids, and were observed by researchers at Oak Ridge National Laboratory, working in collaboration with Max Planck Institute and University of Cambridge on 4 April 2016. On 16 August 2018, a strong evidence for the existence of Majorana bound states (or Majorana anyons) in an iron-based superconductor, which many alternative trivial explanations cannot account for, was reported by researchers in Prof. Gao Hong-jun's team and Prof. Ding Hong's team at Institute of Physics, Chinese Academy of Sciences and University of Chinese Academy of Sciences, when they used scanning tunneling spectroscopy on the superconducting Dirac surface state of the iron-based superconductor. It was the first time that Majorana particles were observed in a bulk of pure substance. Majorana bound states can also be realized in quantum error correcting codes. This is done by creating so called 'twist defects' in codes such as the Toric code which carry unpaired Majorana modes. The braiding of Majoranas realized in such a way forms a projective representation of the braid group. Such a realization of Majoranas would allow them to be used to store and process quantum information within a quantum computation. Though the codes typically have no Hamiltonian to provide suppression of errors, fault-tolerance would be provided by the underlying quantum error correcting code. ^ "Quantum Computation possible with Majorana Fermions" on YouTube, uploaded 19 April 2013, retrieved 5 October 2014; and also based on the physicist's name's pronunciation. ^ Majorana, Ettore; Maiani, Luciano (2006). "A symmetric theory of electrons and positrons". In Bassani, Giuseppe Franco (ed.). 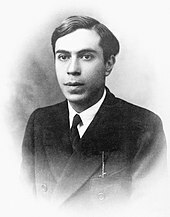 Ettore Majorana Scientific Papers. pp. 201–33. doi:10.1007/978-3-540-48095-2_10. ISBN 978-3-540-48091-4. Translated from: Majorana, Ettore (1937). "Teoria simmetrica dell'elettrone e del positrone". Il Nuovo Cimento (in Italian). 14 (4): 171–84. Bibcode:1937NCim...14..171M. doi:10.1007/bf02961314. ^ Pospelov, Maxim; ter Veldhuis, Tonnis (2000). "Direct and indirect limits on the electro-magnetic form factors of WIMPs". Physics Letters B. 480 (1–2): 181–186. arXiv:hep-ph/0003010. Bibcode:2000PhLB..480..181P. doi:10.1016/S0370-2693(00)00358-0. ^ Ho, Chiu Man; Scherrer, Robert J. (2013). "Anapole Dark Matter". Physics Letters B. 722 (8): 341–346. arXiv:1211.0503. Bibcode:2013PhLB..722..341H. doi:10.1016/j.physletb.2013.04.039. ^ Wilczek, Frank (2009). "Majorana returns" (PDF). Nature Physics. 5 (9): 614–618. Bibcode:2009NatPh...5..614W. doi:10.1038/nphys1380. ^ Nayak, Chetan; Simon, Steven H.; Stern, Ady; Freedman, Michael; Das Sarma, Sankar (2008). "Non-Abelian anyons and topological quantum computation". Reviews of Modern Physics. 80 (3): 1083–1159. arXiv:0707.1889. Bibcode:2008RvMP...80.1083N. doi:10.1103/RevModPhys.80.1083. ^ N.B. Kopnin; M.M. Salomaa (1991). "Mutual friction in superfluid 3He: Effects of bound states in the vortex core". Physical Review B. 44 (17): 9667–9677. Bibcode:1991PhRvB..44.9667K. doi:10.1103/PhysRevB.44.9667. ^ Volovik, G. E. (1999). "Fermion zero modes on vortices in chiral superconductors". JETP Letters. 70 (9): 609–614. arXiv:cond-mat/9909426. Bibcode:1999JETPL..70..609V. doi:10.1134/1.568223. ^ Read, N.; Green, Dmitry (2000). "Paired states of fermions in two dimensions with breaking of parity and time-reversal symmetries and the fractional quantum Hall effect". Physical Review B. 61 (15): 10267–10297. arXiv:cond-mat/9906453. Bibcode:2000PhRvB..6110267R. doi:10.1103/PhysRevB.61.10267. ^ Kitaev, A. Yu (2001). "Unpaired Majorana fermions in quantum wires". Physics-Uspekhi Supplement. 44 (131): 131–136. arXiv:cond-mat/0010440. Bibcode:2001PhyU...44..131K. doi:10.1070/1063-7869/44/10S/S29. ^ Moore, Gregory; Read, Nicholas (August 1991). "Nonabelions in the fractional quantum Hall effect". Nuclear Physics B. 360 (2–3): 362–396. Bibcode:1991NuPhB.360..362M. doi:10.1016/0550-3213(91)90407-O. ^ Fu, Liang; Kane, Charles L. (2008). "Superconducting Proximity Effect and Majorana Fermions at the Surface of a Topological Insulator". Physical Review Letters. 10 (9): 096407. arXiv:0707.1692. Bibcode:2008PhRvL.100i6407F. doi:10.1103/PhysRevLett.100.096407. PMID 18352737. ^ Reich, Eugenie Samuel (28 February 2012). "Quest for quirky quantum particles may have struck gold". Nature News. doi:10.1038/nature.2012.10124. ^ Amos, Jonathan (13 April 2012). "Majorana particle glimpsed in lab". BBC News. Retrieved 15 April 2012. ^ Mourik, V.; Zuo, K.; Frolov, S. M.; Plissard, S. R.; Bakkers, E. P. A. M.; Kouwenhoven, L. P. (12 April 2012). "Signatures of Majorana fermions in hybrid superconductor-semiconductor nanowire devices". Science. 336 (6084): 1003–1007. arXiv:1204.2792. Bibcode:2012Sci...336.1003M. doi:10.1126/science.1222360. PMID 22499805. ^ Rokhinson, L. P.; Liu, X.; Furdyna, J. K. (2012). "Observation of the fractional ac Josephson effect: the signature of Majorana particles". Nature Physics. 8 (11): 795–799. arXiv:1204.4212. Bibcode:2012NatPh...8..795R. doi:10.1038/nphys2429. ^ Kwon, H.-J. ; Sengupta, K.; Yakovenko, V. M. (2004). "Fractional ac Josephson effect in p- and d-wave superconductors". The European Physical Journal B. 37 (3): 349–361. arXiv:cond-mat/0210148. Bibcode:2004EPJB...37..349K. doi:10.1140/epjb/e2004-00066-4. ^ Deng, M.T. ; Yu, C.L. ; Huang, G.Y. ; Larsson, M.; Caroff, P.; Xu, H.Q. (28 November 2012). "Anomalous zero-bias conductance peak in a Nb-InSb nanowire-Nb hybrid device". Nano Letters. 12 (12): 6414–6419. Bibcode:2012NanoL..12.6414D. doi:10.1021/nl303758w. PMID 23181691. ^ Das, A.; Ronen, Y.; Most, Y.; Oreg, Y.; Heiblum, M.; Shtrikman, H. (11 November 2012). "Zero-bias peaks and splitting in an Al-InAs nanowire topological superconductor as a signature of Majorana fermions". Nature Physics. 8 (12): 887–895. arXiv:1205.7073. Bibcode:2012NatPh...8..887D. doi:10.1038/nphys2479. ^ Churchill, H. O. H.; Fatemi, V.; Grove-Rasmussen, K.; Deng, M.T. ; Caroff, P.; Xu, H.Q. ; Marcus, C.M. (6 June 2013). "Superconductor-nanowire devices from tunneling to the multichannel regime: Zero-bias oscillations and magnetoconductance crossover". Physical Review B. 87 (24): 241401(R). arXiv:1303.2407. Bibcode:2013PhRvB..87x1401C. doi:10.1103/PhysRevB.87.241401. ^ Deng, M.T. ; Yu, C.L. ; Huang, G.Y. ; Larsson, Marcus; Caroff, P.; Xu, H.Q. (11 November 2014). "Parity independence of the zero-bias conductance peak in a nanowire based topological superconductor-quantum dot hybrid device". Scientific Reports. 4: 7261. arXiv:1406.4435. Bibcode:2014NatSR...4E7261D. doi:10.1038/srep07261. PMC 4248274. PMID 25434375. ^ Wiedenmann, J.; Bocquillon, E.; Deacon, R. S.; Hartinger, S.; Herrmann, O.; Klapwijk, T. M.; Maier, L.; Ames, C.; Brune, C.; Gould, C.; Oiwa, A.; Ishibashi, K.; Tarucha, S.; Buhmann, H.; Molenkamp, L. W. (2016). "4-pi-periodic Josephson supercurrent in HgTe-based topological Josephson junctions". Nature Communications. 7: 10303. arXiv:1503.05591. Bibcode:2016NatCo...710303W. doi:10.1038/ncomms10303. PMC 4735757. PMID 26792013. ^ Lutchyn, Roman M.; Sau, Jay D.; Das Sarma, S. (August 2010). "Majorana Fermions and a Topological Phase Transition in Semiconductor-Superconductor Heterostructures". Physical Review Letters. 105 (7): 077001. arXiv:1002.4033. Bibcode:2010PhRvL.105g7001L. doi:10.1103/PhysRevLett.105.077001. PMID 20868069. ^ Oreg, Yuval; Refael, Gil; von Oppen, Felix (October 2010). "Helical Liquids and Majorana Bound States in Quantum Wires". Physical Review Letters. 105 (17): 177002. arXiv:1003.1145. Bibcode:2010PhRvL.105q7002O. doi:10.1103/PhysRevLett.105.177002. PMID 21231073. ^ Lee, E. J. H.; Jiang, X.; Houzet, M.; Aguado, R.; Lieber, C.M. ; Franceschi, S.D. (15 December 2013). "Spin-resolved Andreev levels and parity crossings in hybrid superconductor–semiconductor nanostructures". Nature Nanotechnology. 9 (1): 79–84. arXiv:1302.2611. Bibcode:2014NatNa...9...79L. doi:10.1038/nnano.2013.267. PMID 24336403. ^ M.T. Deng; S. Vaitiekėnas; E. B. Hansen; J. Danon; M. Leijnse; K. Flensberg; J. Nygård; P. Krogstrup; C.M. Marcus (2016). "Majorana bound state in a coupled quantum-dot hybrid-nanowire system". Science. 354 (6319): 1557–1562. arXiv:1612.07989. Bibcode:2016Sci...354.1557D. doi:10.1126/science.aaf3961. PMID 28008065. ^ "Majorana fermion: Physicists observe elusive particle that is its own antiparticle". Phys.org. 2 October 2014. Retrieved 3 October 2014. ^ "New Particle Is Both Matter and Antimatter". Scientific American. 2 October 2014. Retrieved 3 October 2014. ^ Woollaston, Victoria (4 April 2016). "Mysterious new state of matter discovered". Daily Mail. Retrieved 4 April 2016. ^ He, Qing Lin; Pan, Lei; Stern, Alexander L.; Burks, Edward C.; Che, Xiaoyu; Yin, Gen; Wang, Jing; Lian, Biao; Zhou, Quan (21 July 2017). "Chiral Majorana fermion modes in a quantum anomalous Hall insulator–superconductor structure". Science. 357 (6348): 294–299. arXiv:1606.05712. Bibcode:2017Sci...357..294H. doi:10.1126/science.aag2792. ISSN 0036-8075. PMID 28729508. ^ Emily Conover (20 July 2017). "Majorana fermion detected in a quantum layer cake". Science Magazine. ^ Wang, Dongfei; Kong, Lingyuan; Fan, Peng; Chen, Hui; Zhu, Shiyu; Liu, Wenyao; Cao, Lu; Sun, Yujie; Du, Shixuan (16 August 2018). "Evidence for Majorana bound states in an iron-based superconductor". Science. 362 (6412): 333–335. arXiv:1706.06074. Bibcode:2018Sci...362..333W. doi:10.1126/science.aao1797. ISSN 0036-8075. PMID 30115743. ^ Bombin, H. (14 July 2010). "Topological Order with a Twist: Ising Anyons from an Abelian Model". Physical Review Letters. 105 (3): 030403. arXiv:1004.1838. Bibcode:2010PhRvL.105c0403B. doi:10.1103/PhysRevLett.105.030403. PMID 20867748. ^ Zheng, Huaixiu; Dua, Arpit; Jiang, Liang (2015). "Demonstrating non-Abelian statistics of Majorana fermions using twist defects". Physical Review B. 92 (24): 245139. arXiv:1508.04166. Bibcode:2015PhRvB..92x5139Z. doi:10.1103/PhysRevB.92.245139. ^ Barkeshli, Maissam; Jian, Chao-Ming; Qi, Xiao-Liang (2013). "Twist defects and projective non-Abelian braiding statistics". Physical Review B. 87 (4): 045130. arXiv:1208.4834. Bibcode:2013PhRvB..87d5130B. doi:10.1103/PhysRevB.87.045130. ^ Hastings, M. B.; Geller, A. (2015). "Reduced Space-Time and Time Costs Using Dislocation Codes and Arbitrary Ancillas" (PDF). QIC. 15: 0962–0986. arXiv:1408.3379. Bibcode:2014arXiv1408.3379H.